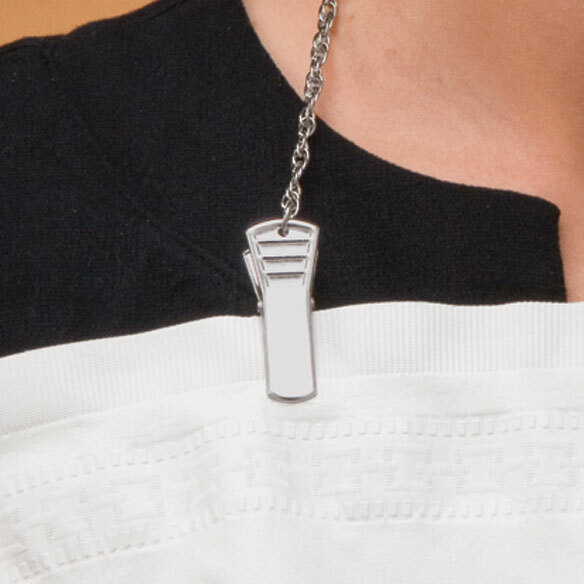 Instead of tucking your napkin into your shirt, just hang it from this handy napkin clip. Works with cloth or paper napkins; bib clip also holds eyeglasses. 21 1/2"L.
Worked great for 1-21 march to secure my sign. I use it in restaurants for my napkin. My chest always catches spills before they reach my lap so the napkin must be high. I also use it to carry my signs when i'm demonstrating for equal rights & social justice. Love my napkin clip - wouldn't want to be without it! Everything is great about the napkin clip. It is very easy to use - I am able to put it on myself and it keeps my clothing clean and neat during meal and snack times. had been looking for this for some time. Works so much better than trying to keep napkin in place while my Father eats. Wipe and keep in car so that it's always there when we eat out. My 3 messy teenage boys have saved their shirts from so many food stains ever since I started insisting that these napkin clips be worn during meal times. These clips are a must and easily attach to paper napkins and stay secured around their necks during meals. Works better than tucking a paper napkin in a shirt collar. My husband took to it immediately, and it has saved many a food spot on his shirts. We are senior of seniors, and sometimes our hands are unsteady. It's a great help. Very useful. I use it every meal. A great product to prevent stains on your clothes without spending a lot on bibs. very convenient while dining out. very accessible when needed to protect clothing while eating out in a restaurant. Saw these online and purchased several so my teen boys could get through a meal without staining their shirts. These work just like the ones our dentist uses to secure the paper bib around your neck. 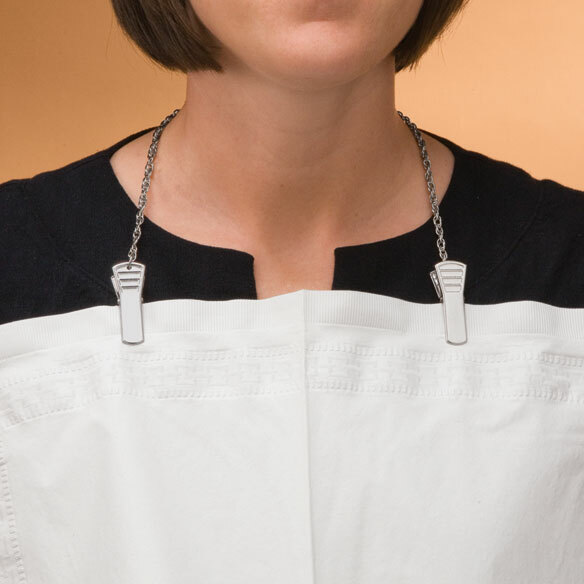 These clips will hold a large paper napkin in place and will save your shirt from getting stained. No need to have to tuck a paper napkin in your collar anymore. I keep this in my purse to use when eating out. Nothing worse than getting food stains on your clothing when you're out and about, which always seems to happen. I've had several comments on it in just the few times I've used it...a really great idea. What we needed, but too much chain. First time I start to attache clips to napkin, clips fall off of chain! Lucky man was with me reattached them. I have Parkinson's Disease...Need I say more? An easily portable way to protect my clothing when dining out. I use them and they are a big help. My friends asked me to get the clips for them, so that's why I'm ordering more. convenience and ease to carry. wanted these for years. Finally at an age where I won't be embarrassed using it. For my mother to help her keep her napkin in place during meals. This should solve my problem in soiling my clothes while eating. Needed napkin holder for mother in law. I have a friend that's blind and this will help keep his clothes clean while eating. As we get older, both my husband & I need protection for our clothes when eating. Use to help hold on magnifier and hold napkin on when out to eat! I always spill on the front of my shirt. Tired of tucking in my napkin but definitely need a bib. My bff wanted it to hold his napkins in place when he eats. My husband is always loosing his napkin. Thought this might be a solution. I lost one that I previously purchased. my aunt needs it when she eats. We keep dripping things on our clothes when eating. previously had one which is lost.I clip it to a hand towel while I eat.No more food on my clothes. Have 2 already & friends wanted them! Very handy. I am caregiver for my mom and I think this would be helpful. To keep salad dressing off my blouses and food off my husbands clothes. I have one and use it every time I eat in a restaurant. I need one in every purse! MY RIGHT ARM WAS IN A SLING AND IT WAS VERY DIFFICULT TO KEEP A NAPKIN IN FRONT OF ME. Have one and use it constantly. To hold dining napkin in place to protect clothing and also with eyeglasses. couldn't find them in any store!! need something to hold up and this looks like what will work for us. are the bibs paper or fabric? BEST ANSWER: Thank you for your question. This is just the chain. We hope this information will be of help to you. I did not order the bibs, only the metal clips, which, by the way, work very well.